It is with great excitement that I can announce “subscribe” comments on Drupal.org issues are now dead! Long live issue following! Issue e-mail notifications are also improved. Almost exactly 6 years after #34496: [meta] Add Flag module to allow users to subscribe/unsubscribe without posting a comment was originally posted, this feature is finally done and deployed on Drupal.org. If you notice any problems, please go to #1306554: QA for issue following on Drupal.org and comment there. In the past, you had to comment on an issue in order to keep track of it, commonly done by posting “subscribe” (or variations thereof). Popular issues gained plenty of such comments, making it hard for contributors to distill the important and useful information in an issue. 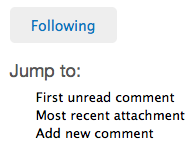 You are now able to “follow” issues by clicking a button, without commenting on them. You can also “unfollow” issues, even ones you had to comment on but you are not really interested in. 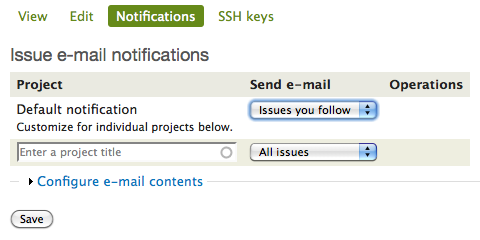 Lastly, you can now configure for which projects and issues you want to get e-mail notifications. The 88 members of the community that contributed to the 2 chip-ins to raise a total of $2777.27 towards the original goal of $7,000. This sponsorship allowed 3281d Consulting to focus on this project and get it deployed ASAP. There are two big inter-related changes as part of this effort: how we interact with issues on Drupal.org, and changes to the issue e-mail notification functionality. Clicking the “Follow” button will use AJAX to flag the issue as one you are following. This will trigger two things: 1) the issue appears in the “Your Posts” and “Your Issues” lists (both on your dashboard and the separate tabs on your profile), and 2), the “Follow” button will be replaced with “Following”, to indicate you’re now following the issue. You can even unfollow issues if you wrote them or commented on them. 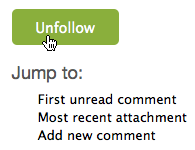 Whenever you click the “Unfollow” button the issue will disappear from your tracker and you will stop getting e-mail notifications about it (if you get e-mail notifications at all). In the past, there was no way to define a site-wide setting, so users often had to configure e-mail notifications across a large number of projects. 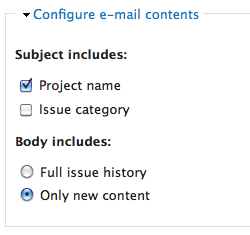 If you used to be subscribed to 50 or more projects with the “Own issues” setting, that was converted as part of the deployment into a single site-wide default. There are more ideas to further improve the issue e-mail notification experience, so be sure to read the “Future work” section below. While the financial sponsorship was critical to allowing me to spend the time I needed to drive this home, tons of other people contributed to help make this a reality. Daniel F. Kudwien (sun) and Chad Phillips (hunmonk) wrote and reviewed many patches related to this effort. Leisa Reichelt (leisareichelt) started the Prairie Initiative which has been instrumental in raising awareness about the need to fix the collaboration tools on Drupal.org. She also provided lots of extremely helpful user experience (UX) and user interface (UI) feedback. Roy Scholten (yoroy) and Bojhan Somers (Bojhan) provided extensive usability, user interface and user experience reviews and suggestions. Everett Zufelt (Everett Zufelt) provided accessibility reviews and feedback. Angela Byron (webchick) helped herding cats, reviewing things, testing, giving feedback, and generally was awesome (as always). Narayan Newton (nnewton), Gerhard Killesreiter (killes) and Neil Drumm (drumm) did performance reviews, got the staging site up, and provided general Infrastructure Team goodness. Nathan Haug (quicksketch) answered a lot of questions about the internals of the Flag module for the data migration, and helped trying to get the new follow UI working smoothly. Jerad Bitner (sirkitree) and Moshe Weitzman (moshe weitzman) wrote the initial patches for a couple of the key issues. dereine, amateescu, eliza411, ksenzee, Caligan, xjm, Crell, jhodgdon, pillarsdotnet, timplunkett, naught101, kathyh__, wizonesolutions, techninja, hefox, jwalling, joshuabud, otseld, and torthu helped test the upgrade-while-live data migration code. Lisa Rex (lisarex) helped edit this post. Everyone else who contributed reviews, testing or implementation suggestions for all the issues related to getting this done. As exciting as all of this is, of course there’s always more work to do. Generally, we’ve been using the flag integration issue tag to keep track of things related to this effort. 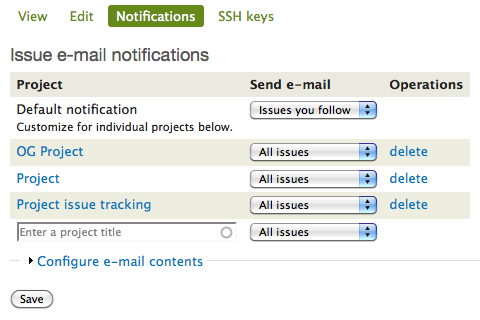 See also the drupal.org notifications tag. You can also check out the Expand “follow” functionality on Drupal.org community initiative page. Unfortunately, I’m going to have to return to other commitments, so I can’t just continue to pour unlimited time into getting all of these issues done, UX reviews, code reviews, etc. So, if anyone wants to step up and claim any of these issues to drive them to completion, that would be greatly appreciated.